An estimated 850 animal lovers took over the full length of the Fremantle traffic bridge this morning to protest against livestock trade from Fremantle port. The peaceful protest did not interrupt the usual busy Sunday traffic. 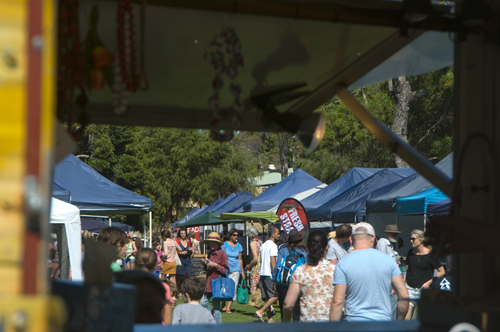 There is still plenty of time to go to the Fremantle GROWERS GREEN MARKETS today. It’s open till midday and I took this photo half an hour ago. It is at Lefroy Road in front of the South Fremantle Senior High School. It is a very community ambience and great fresh produce, plus fantatstic breads and pastries, meat, smoked salmon, the loveliest freerange eggs around, food stalls and more, so go for a stroll, buy some brekkie and coffee and enjoy the glorious day. Also on is the Fremantle Arts Centre courtyard music but I can’t tell you who is playing today as it is not posted on the FAC Facebook page. I had a wander around Port Coogee by Australand this morning and was quite impressed with the quiet elegance and eye for detail of the place. It is unashamedly modern-but not sterile-and I unashamedly admit I like good modern architecture as much as I like stunning old heritage buildings. There is already good public art, an attempt at greening the area, a nice marina, funky playground, a striking bridge and a cobblestone street. In my humble opinion it has great potential once a community and sense of place is established with a form of ‘town centre’. What it isn’t at all is Hillary’s, so that shows that one has to take the promises of developers with a million grains of salt, because supposedly this was going to become a huge tourist attraction just south of Fremantle, well, it won’t. It is well worth having a look at though and a nice hotel there would not be out of place, but that would require better public transport down that corridor, ideally as light rail. I published a letter from a concerned parent last week that Lonestar in the Cockburn Gateway shopping centre sells buckets of peanuts and that this poses a real threat to his young son who has a severe peanut allergy. This week the West Australian also published an article with a photo of the parents and their two children and the public outcry on social media has been quite devastating to them. There has been unbelievable abuse, people writing that it is just natural that weaker children should die, and yesterday some morons even smeared peanut butter on the house where they live thus threatening the life of the allergic child. That is extreme fascist behaviour by ignorant and uncaring morons! Sure, we can have a debate if it is community’s responsibility to deal with allergies or if it is only the problem of those concerned and parents should simply restrict the movements of their children rather than the community being restricted to what they eat and do. But that debate needs to be a mature and informed one and should not be about attacking the poor parents who rightly want to protect their child. Freedom of speech is not freedom of abuse, and engaging in fascist behaviour. Those who attacked the parents should be ashamed of themselves. Children are sacred and have every right to expect to be safe and protected, and I for one believe the entire community should be taking responsibility for that. The issue here is much bigger than just peanuts. P.S. I have not mentioned the name of the family as I do not want them to receive more abuse. The father works here in Fremantle and I know him well. The recent debate at Fremantle Council about Ward representation and local government elections made me think about the relevance of them when only around 25 percent of the electorate bothers to vote at Council elections, while the rest stays at home. So do we really get community representation and the claimed community democracy I speak so highly about? Fremantle Residents and Ratepayers Association(FRRA) President Mark Woodcock made good points earlier this week about it, writing that in the 2011 Council election Bill Massie, Jon Strachan and Robert Fittock got in unopposed while in the 2013 election Josh Wilson and David Cogging did not have candidates standing against them. North Fremantle Ward Councillor Fittock was unopposed at the 2007 and 2011 elections, so how could he possibly claim to speak on behalf of constituents. That is not an attack on Robert or any of the other unopposed Elected Members, but showing that there is an unbelievable apathy when it comes to electing community leaders to speak on our behalf at local councils. From memory just over 25% of voters bothered to vote at the last Freo Council election. In light of these figures, would it make one iota of a difference if we have a Ward system in place at the start of the council amalgamation with East Fremantle? Aren’t Wards very NIMBY anyway and not relevant to the bigger picture, because Councillors are required to vote for what they consider best for the entire community, not just the Wards they represent. We often read about silent majorities when elected members in local, state and federal governments go against the opinion of the vocal and involved members of the public, but if the so-called silent majority at Council level can’t bother to vote they have no voice and should not claim to have a silent one. If you can’t be bothered to turn up at the Townhall once every four years to vote for your preferred local candidate for your Ward than you have given away your right to whinge and to expect better representation for your local issues. You are not part of the silent majority but of the apathetic majority. That apathy is shown every week at Council committees and full Council when hardly anyone turns up in the public gallery. Often it is just Mark Woodcock and I who sit through those evenings observing how local democracy works. Only those with a self interest now and then turn up and address council, often not even understanding basic Council procedures. Democracy is a privilege that people in many countries in the world still only can dream about, but we in the western world take it for granted and give it the cold shoulder, when it should really matter to all of us who will lead Fremantle into the future. Having Wards is less important than getting rid of voters apathy. The things that take me away from a bad mood and crappy days are taking photos, sit at the ocean, or enjoy the great Australian bush, so today it was happy snapper time for a very disappointed Loopy. The Christmas tree at Fremantle Kings Square was lit by Mayor Brad Pettit and there were carols, Santa and the invigorating WASAMA drummers all lit up and that made for interesting movement photos. Go and check out the lights and also wander down High Street to see them all along there, and walk trough the Whalers Tunnel to see the lit up historic Arthur Head. The kids will tell you you are the best mum and dad in the world! There were a lot of people and traffic in Fremantle this morning with many of the passengers of the cruiseliner Diamond Princess enjoying our heritage-rich city. There was a nice market at Kings Square and a real buzz around town, so I hope our retailers and the cafes will benefit from it. I took some photos with a pretty long lens to show how massive the Diamond Pincess is. ENJOY ROEL’S FREMANTLE PHOTO TOURS! Summer and Christmas are fast approaching so it is time to spoil yourself, your loved ones and your friends and join one of ROEL’S FREMANTLE PHOTO TOURS! The fact I am no longer working at the market on Saturdays means I now also have time to take you around gorgeous Freo on that day and show you how to get better photos of the historic city, the port and the beach. It only costs $ 50.00 per person for the four-hour tour and kids are welcome and free. Gift vouchers available! Book by email: roel.loopers@ii.net or text 0419 850981. Comments Off on ENJOY ROEL’S FREMANTLE PHOTO TOURS! WHEN IS PUBLIC SPACE PUBLIC? I do’t think anyone can question my support for the soon to open Bathers Beach House in Fremantle, but I have had many questions from the Freo community why the City of Fremantle has allowed the operators to intrude so far into public open space and the historic Old Port Project the City has been so protective off. Around 200 square metres of the black tar area have been handed over for the largest alfresco area on public land in the city. It is my understanding this was in lieu of the developers paying for the sewer upgrade. People rightly asked if the operators of the BBH will have to pay alfresco fees for all the tables, as all other hospitality operators in Fremantle do, or if the in lieu also includes no alfresco fees for the duration of the lease, which is about 20 years. The second complaints are over the intruding sunroof that covers half of the narrow boardwalk and makes the experience claustrophobic some claim. 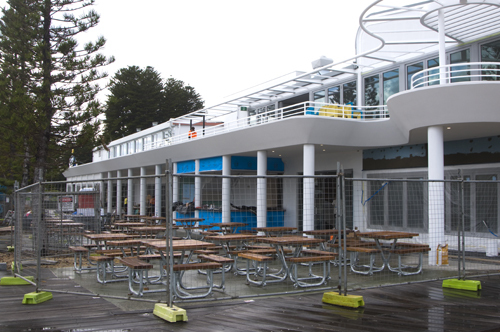 The Bathers Beach House will open on Monday December 8 and will no doubt become a great attraction for locals and tourists. It’s a great spot to sit and watch the sun set over the majestic Indian Ocean, so go and support the new local business. 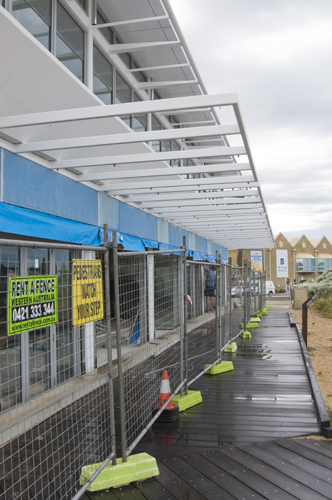 Among a long list of agenda items Fremantle Council last night debated the pros and cons of having a Wards system in place for the first election of the new supersize-withoutf fries- City of Fremantle after the amalgamation with the Town of East Fremantle. Councillor Andrew Sullivan held a passionate speech in support of the Wards and how important they are for real local government democracy and input from the community in Council’s decision-making process. Councillor Doug Thompson however warned against waiting for Wards to be implemented as that would mean extending the time a Commissioner will be in charge, saying Commissioners could do a lot of harm and might undo what Council has been trying to achieve for years. He cited Canning and Cockburn as examples. I am a strong supporter of local government as that it where real grassroots democracy can work if Councillors listen to and respect the opinion of the community, but at the same time I wonder if for example the City Ward electors, especially business owners, feel well represented by Councillors Pemberton and Naber. It was interesting to hear from CEO Graeme McKenzie that State Government has indicated they might prefer to make the Mayors of the amalgamating councils Commissioners with support from a third party. The many strong opponents of Brad Pettitt could well be up in arms if he was given almost free reign for nine months or so. Interesting times ahead for Freo!